Watch The Throne feels like an entirely unique record, especially for Hip Hop. In rock, artists can juggle bands and make interesting records with multiple group formats (see Grizzly Bear, Deerhunter), but Hip Hop has struggled with the “super group” concept. The longstanding kinship between these two artists is the easy answer for its success, and they both have each other to thank for their current standing. Kanye gave Jay-Z’s career a bit of a recharge with his production on 2001’s The Blue Print, and Jay-Z gave Kanye his break in both production and rap when he signed him to Roc-a-fella. The two have made dozens of memorable records over the last ten years, and a full-length feels entirely natural and almost necessary. This record manages to crush expectations. Kanye remains reverential to his “Big Brother”, but West is riding such a hot streak that it seems erroneous to deny him the top spot in the game right now. However, Hov is still the king and Kanye plays with it “Bumper sticker reads what would Hova do?” on “Otis” (which must have been so expensive to sample). 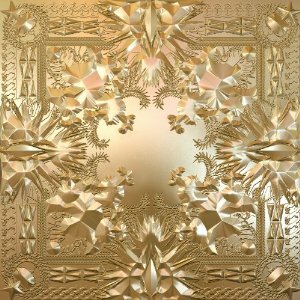 No expense is spared on this record, and if any record is literally worth its price Watch The Throne is easy to justify. Opulence, and luxury rule and what else would you expect from kings? Jay raps about shopping in boutiques in Paris, and Kanye mentions owning women. The production is slick and sounds like nothing else in the music landscape. I didn’t know it was possible to make a better sounding record than last year’s classic by Kanye, My Dark Twisted Fantasy, but Watch The Throne is right there and worth buying for that alone. And is it me or do multiple songs end with a Grizzly Bear-esque musical accoutrement? Kanye, like a top-notch point guard has always been able to pull the best from the artists he works with, and Jay is absolutely fire breathing on this record. He’s at his best and most confident since The Blueprint for sure. Beyonce sounds excellent on “Lift Off”, making for a family feel. Frank Ocean and Mr. Hudson also contribute memorable moments, and the Rza’s production on “New Day” is his strongest in years. Lyrically the album showcases both men at their finest. “New Day” has both talking to their unborn sons wishing for a better/easier life than they have. Kanye raps “I’ll never let my son have an ego. I’ll make sure he’ll be nice to everyone that we know” and “never leave your college girlfriend.” while Jay raps “sorry Junior I already ruined ya, you ain’t even alive and paparazzi perusing you.” Jay scans the landscape from above only coming down to take shots at the haters, while Kanye is knee deep in the muck of everyday existence “Sunglasses and Advil, last night was mad real. Sun coming up at five AM, I wonder if they got cabs still”. With our ongoing financial problems as a nation, the ultra excessiveness of “Watch The Throne” makes for an ideal break, and a perfect escape.